Rainer is Professor of Modern European History at the University of Essex and the programmer of the University of Essex’s annual Holocaust Memorial Week. In today's blog, Rainer writes about the Auschwitz 'Gypsy Family Camp', Roma resistance and the gassing of almost 2,900 Roma during the night of 2 August. The construction of a special camp for Roma at Auschwitz-Birkenau (section B II e) had begun before Himmler’s decree of 16 December 1942. However, when the first transport of some 200 Sinti and Roma from Buchenwald concentration camp arrived on 26 February 1943, it was not fully finished, and they were forced to work on its completion. Unlike the Jews, Roma men, women and children were not separated, which is why the camp was called Zigeunerfamilienlager (Gypsy Family Camp). There was no selection to divide those fit for work and those immediately destined for the gas chambers either, and very few were conscripted to do forced labour outside the Zigeunerfamilienlager, although some had to work in the camp itself. All arrivals were tattooed on their arms (babies on their thighs) with a number prefixed by a Z for Zigeuner, meaning Gypsy. Their hair was shorn off, but they were allowed to grow it again. Most kept their clothing, but they had to wear a black triangle (for ‘asocial’) attached to it, often with a ‘Z’ inscribed. Later, a brown triangle was introduced. Living conditions in the Gypsy Camp were grim. Food supplies were totally inadequate, disease was rampant, and the inmates were subjected to serious maltreatment by the SS. In May 1943, Dr Josef Mengele was posted to Auschwitz-Birkenau and became the camp doctor of the Zigeunerfamilienlager. One focus of his ‘medical research’ was on identical twins, and he took a particular interest in the Sinti and Roma children, subjecting his victims to ruthless experiments and horrifying torture, and killing many of them in order to dissect parts of their bodies. While acts of resistance were never likely to be successful in the face of the overwhelming German power, there were a number of instances where Sinti and Roma attempted to defy their persecutors and preserve their dignity and humanity. There were attempts to escape from the Zigeunerfamilienlager, there was subtle sabotage of SS instructions, news was smuggled out written in Romanes, and, above all, there was solidarity and mutual help and support, especially among family members. An attempt by the SS on 16 May 1944 to round up a large number of Sinti and Roma to transport them to the gas chambers was thwarted by organised resistance. News about the impending operation had spread, and Roma men barricaded themselves in their barracks, determined to fight back against the SS. As a result of this resistance, the operation was broken off on this occasion. However, on the night of 2 August 1944, there was no such respite. All Roma still left at the Zigeunerfamilienlager, almost 2,900 mostly elderly and infirm men, as well as women and children, were given a ration of bread and salami and were told that they would be transported to another camp. Feeding into this deception, the SS loaded them on to lorries. But rather than a substantial journey to another camp, they were only driven a short distance to the nearby gas chambers. By the morning, the camp was empty. This marked the end of the Auschwitz Zigeunerfamilienlager. Over its 17-month existence, some 22,650 Roma prisoners were deported to the Zigeunerfamilienlager (this figure includes the 360 children born in the camp). Around 85 per cent of them perished. Some 13,150 died through criminal wilful neglect (starvation, illness, ill-treatment and exhaustion), and around 5,700 were murdered in the gas chambers, more than half of them during the night of 2 August. This night has retained a particular resonance for the Roma community and remains a painful reminder of their persecution by the Nazis. Since 1997 it has been marked internationally as Romani Extermination Remembrance Day, and in 2015 the European Parliament designated this day as European Roma Holocaust Memorial Day, reflecting the importance of this night for Roma and the wider European cultural memory. However, Roma activists increasingly feel that they do not want to be remembered solely as helpless victims of the Nazis. Therefore, in addition to 2 August, they have begun celebrating 16 May as Romani Resistance Day to serve as an inspiration for the battle against the continuing discrimination of the Roma in Europe today. 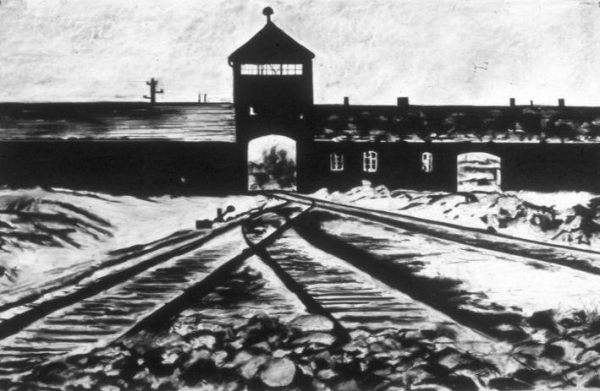 Image credit: Marty Kolb: Tracks to Death (Auschwitz-Birkenau). Charcoal on Paper, 40” x 25.5” (Holocaust Series # 23) (Collection Skirball Museum, Hebrew Union College, Los Angeles, California).